In creating this review, I'm struggling to stay in the voice of a slightly stodgy middle-aged reader, who normally expresses herself, at least when writing reviews, in measured, mature, Radio 4-like prose! No, I'm sorry. Miriam Halahmy's Hidden is fabby, awesome, brilliant and cool. It rocks. It ... er ... well, that's all the teenage idiom I can lay hands on for now. But the point is that my 12 or 13-year-old self (never far below the surface) loved this book, as did the older me, and you can't ask for more than that. What's it about? Halahmy's narrator and protagonist is called Alix. She's 14, she's a talented runner and she lives on Hayling Island, a place I'd never come across before but am now determined to visit. Alix's dad has left them for 'Gorgeous Gloria', aka 'the Gremlin'. Mum has recently lost her own father and broken her leg, and appears to be suffering from depression. Alix battles on as best she can, missing her dad and granddad, relying on her dog and her best friend, Kim, for company and support. But Kim is getting caught up in her music and her new boyfriend, 'Trumpet Steven'. And it's hard work for Alix, looking after Mum and the house, doing an early morning paper round in the freezing winter mornings to help Mum with the bills, and trying to keep up with her homework and training as well. All Alix needs is a further complication to her life. But that arrives when she and her new friend Samir encounter an asylum seeker named Mohammed from Iraq - deposited offshore, half-dead from cold, hunger and his dreadful wounds. What can they do? Alix and Samir find shelter for Mohammed and hide him from the authorities, taking him food, hot water bottles and flasks of coffee every day. Are they doing the right thing? Samir and his brother think so, and they've been refugees too, so they understand. But what would Alix's mum say if she knew? How would the police react? And how will Alix and Samir deal with the bullying racists in their class at school? Alix is a marvellous heroine - an apparently ordinary girl who turns out to have enormous reserves of courage and strength, yet who tells her story with disarming honesty and some wonderful touches of humour. Hidden raises questions about refugees and asylum seekers and the way they are treated by our society. Racial prejudice in both adults and youngsters is presented in all its ugliness - and Alix herself learns not to judge by appearances. As an adult reader I felt humbled by the depths of compassion and understanding in this book, written by an author who has worked for many years with asylum seekers and refugees. It's a novel that will stretch the minds of readers of any age, encouraging us to look beyond our everyday concerns to the needs of those on the outer edges of society. This is a thrilling and enjoyable read, perfectly capturing the voice of a 14-year-old girl, in a way that goes deeper than mere teenage vernacular. The descriptions of Hayling Island (look at the opening to Chapter 13, for instance) are superb - yet they come naturally from the pen of Alix herself. Congratulations, Miriam Halahmy and Meadowside Books. I'll be waiting eagerly for the next two books in the series, which are due out soon. 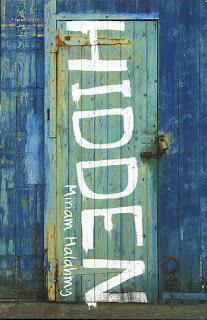 Have heard of HIDDEN as an excellent novel but didn't know much about the storyline, so it's really useful to read this review. If there's a trilogy, I'll need to catch up quickly! I love the cover too and have been saving it up to read. Yes, it's a beautiful cover and perfect for the book. I loved the book too, and the cover!